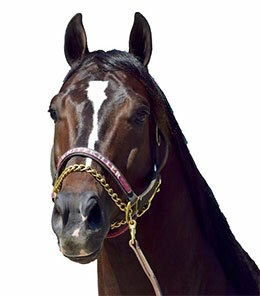 APHA Racing Champion Painted Turnpike will head the $20,000 Paul Harber Memorial. Painted Turnpike Friday at Remington Park. OKLAHOMA CITY, OK—APRIL 10, 2019—Paint-horse racing superstar Painted Turnpike is back at Remington Park this Friday, April 12, competing in the $20,000 Paul Harber Memorial. Painted Turnpike has two prior starts, and wins, in the Paul Harber Memorial as he was triumphant in both 2016 and 2018. Owned and bred in Oklahoma by Nolan Pevehouse of Webbers Falls, Okla. and trained throughout his career by Matt Whitekiller, Painted Turnpike returns to racing while continuing to serve as a stallion. The 6-year-old horse is the all-time leader for Paint horses in earnings with $462,345. He has won 26 of his 29 career attempts and currently enjoys a 14-race winning streak. The last defeat for Painted Turnpike was a second-place finish on Oct. 21, 2016 in the $20,100 Lorelei Derby at Will Rogers Downs in Claremore, Okla.
At Remington Park, Painted Turnpike has been spectacular in winning 13 career races against only one second-place run. He is the all-time leader by wins in the Remington Park American Quarter Horse, Paint and Appaloosa Season. Painted Turnpike enters Friday night’s Paul Harber Memorial just two wins shy of the Remington Park all-time record for victories by any breed of horse. Highland Ice and Elegant Exxactsy, both Thoroughbreds, each won 15 races in Oklahoma City. A son of Pyc Paint Your Wagon (QH) from the SF Royal Quick Flash mare High Class Turnpike, Painted Turnpike will be ridden in the Paul Harber Memorial by jockey Cody Smith who is the only rider to ever guide him in a race. The Paul Harber Memorial is the 10th of 12 races on Friday night with a scheduled time of 10:01pm. The first race of the evening takes place at 6pm.